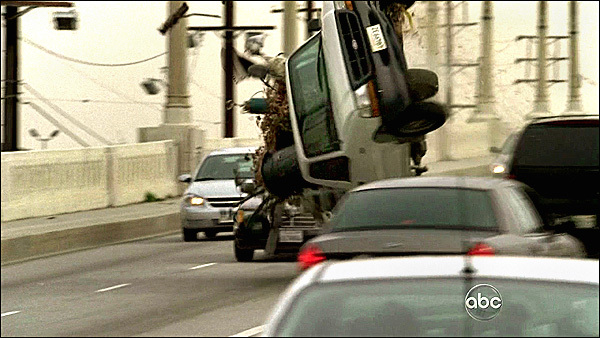 The pilot for this 2010 ABC series opens with a shot of a man waking up in an upside-down car. 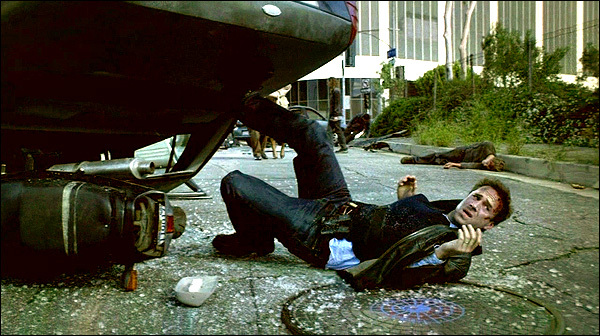 We watch him crawl out of the car, only to find that the whole world has turned upside down... figuratively speaking. That scene was filmed on 4th Street, just southeast of Beaudry Ave, on the west side of the Harbor (110) Freeway, in downtown Los Angeles. The camera is looking northwest in the shot above. That striped office building behind him, the Beaudry Center (at 333 S. Beaudry Ave), houses the headquarters of the L.A. Unified School District. The action then flashes back in time, to just before the FlashForward incident, and shows us what the lead characters were doing just before the blackout struck. We first see an aerial shot of a residential suburb, surrounded by hills, near a lake. The shot below is the Lake Sherwood section of Westlake Village, CA. The camera is looking south. The camera zooms in to the home of Mark & Olivia Benford, at the end of a short cul de sac. Mark (Joseph Fiennes), the man we saw wake up in the car, is an FBI agent. His wife Olivia (Sonya Walger) is a doctor. Their house can be found at 1684 Oakcottage Court, in Westlake Village, in a gated community known as The Meadows at Sherwood. 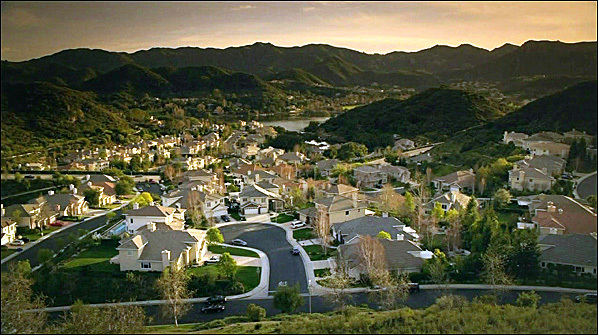 Westlake Village is southwest of the Valley, between Agoura Hills and Thousand Oaks. Next, we see a shot of a pier. 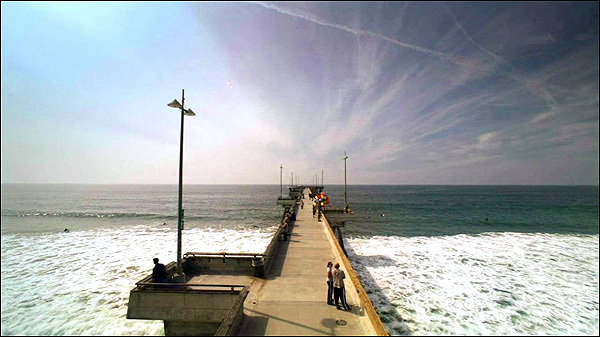 This is the Venice Pier, at the west end of Washington Blvd, in Venice, California. Then we see a man, Bryce Varley (Zachary Knighton), standing on the pier. 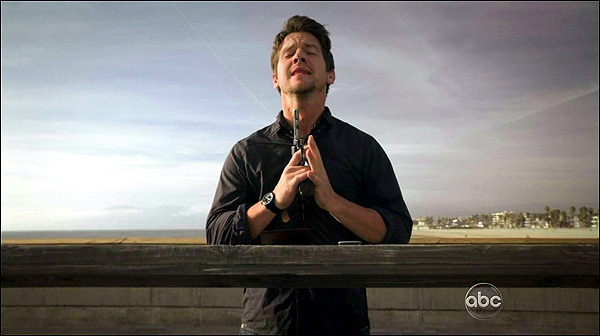 He takes out a gun, and is about to shoot himself when the blackout strikes. Next, we are shown an Alcoholics Anonymous meeting, where Mark Benford is listening to the testimony of Aaron Stark, a man whose daughter was reportedly killed in the Iraq war. Aaron, it turns out, is also Mark's sponsor). 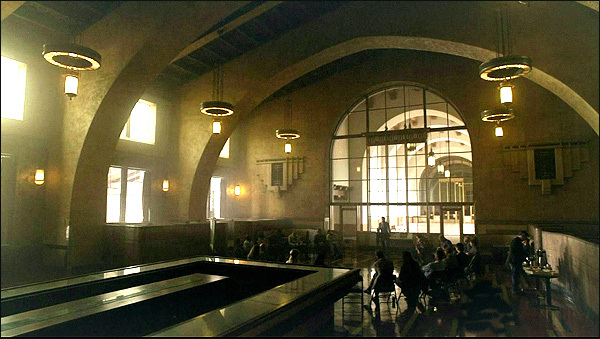 The rather grand, Art Deco setting for this AA meeting should be familiar to many L.A. residents. It's Union Station, what was once the great hub of transportation in Los Angeles, back when trains were the preferred means of travel. You'll find Union Station at 810 N. Alameda Street, in downtown Los Angeles. 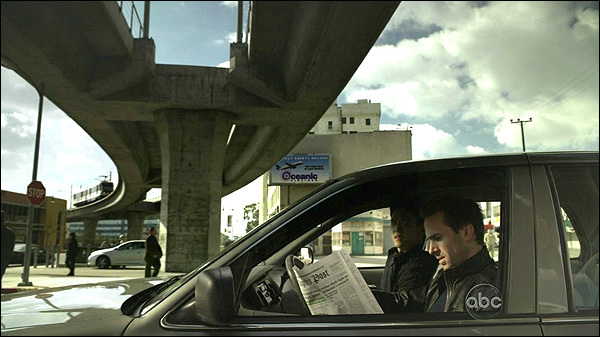 We see Mark on the job with his FBI partner Demetri Noh (John Cho), as the two sit in a car on a stakeout. 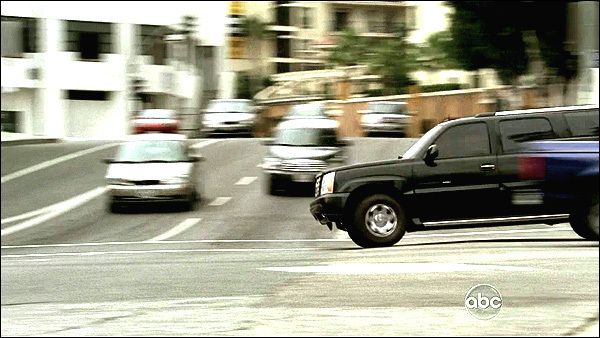 Demetri shoots photos of a group of terrorist suspects as they emerge from a building and head for a car. While the agents wait, their car is parked beneath an unusual bridge. You'll find that bridge in L.A.'s Chinatown. Their car is parked at near 870 N. Spring Street, just south of where College Ave meets Alameda/Spring Street. They're actually parked under the bridge on a short (west/east) connecting road that links Alameda & Spring. When the suspects they're tailing spot them and take off, a wild car chase develops. We first see them headed north on Mateo Street, just south of 4th Street, in the warehouse district of downtown L.A.. 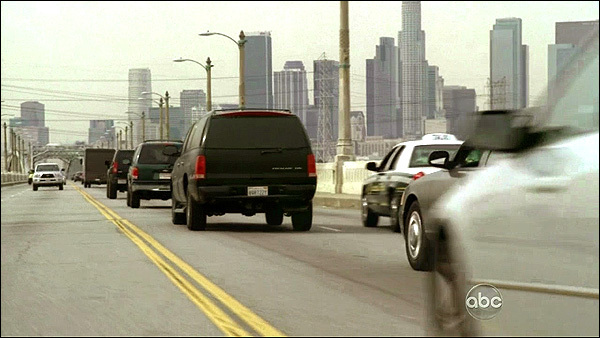 The bad guys make a break for it by turning right (east) onto the E. 6th Street bridge. Although they turn east onto that 6th Street bridge, they are then shown heading WEST (towards downtown) on that same bridge. The chase intensifies as both cars weave through traffic on the bridge, causing a number of ugly accidents along the way. And then something even more surprising happens. In the next shot, the camera suddenly jumps more than two miles to the northwest, as we watch the SUV they are pursuing enter an intersection. That intersection is 4th Street & Beaudry Avenue, in downtown L.A. In the photo above, the camera is looking west/NW up the 1100 block of 4th Street. The van they are chasing is heading south/SW on Beaudry Avenue, as it enters the intersection and makes a left turn onto eastbound 4th Street - with the Feds in hot pursuit.